Don was a charter member of our club, having been, along with his wife Carolyn Curtis, an enthusiastic supporter of Howard Dean’s candidacy for president, from March 2003. When we tabled at the Palo Alto farmers market, campaigning for Howard and registering voters, he’d tell Carolyn he didn’t want to engage (words to that effect), but soon would be deep in amiable conversation, usually with a gent his age. Don was always available to staff the sign-in table at club events. The quintessential morning person, he’d lit-drop and doorhanger on predawn election mornings, until voting by mail put an end to that folk rite. Don was the club’s fourth treasurer; a statistician (labor market analysis) by trade, he was meticulous and dedicated, establishing a two-year budget and seeing to it in meetings that we kept to it. He trained club members in how to lobby legislators, having lobbied for conservation issues (including in Washington), and regularly went to Sacramento with us for healthcare and campaign finance reform. He always presented at our ballot initiative information sessions, with cogent and witty PowerPoints. 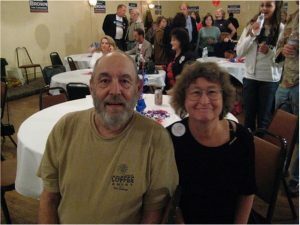 Don and Carolyn were on Jerry McNerney’s election committee 2004-6, and present at Jerry’s headquarters that victorious election night in 2006. 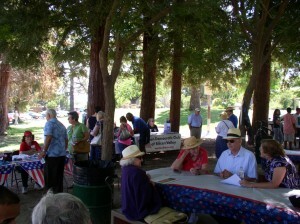 Don also represented the club on the county Democratic Party endorsement committee. In all meetings, he always got right to the point, but was never dismissive, small-minded, or inconsiderate of what others were saying. When he spoke, people shut up and listened. Besides the club, Don’s other main focus was conservation, serving on the local and state level of the California Native Plant Society, specifically the botany and preservation of nearby serpentine areas. He and Carolyn first grew close working to preserve Edgewood in the early nineties (since 1993, Edgewood County Park and Natural Preserve), and Don went on to lead the efforts to keep Coyote Ridge, a major serpentine area south of San Jose, free of development. On Don’s office wall is a photo of him and Jerry McNerney in a wildflower meadow on Coyote Ridge, at that time in Jerry’s district. He and Carolyn enjoyed many trips to wildflower areas and transformed Don’s yard in Palo Alto into a native plant phantasmagoria. More about Don at www.donaldmayallmemorial.com/gallery-1.